The Comprehensibility of the Universe puts forward a radically new conception of science. According to the orthodox conception, scientific theories are accepted and rejected impartially with respect to evidence, no permanent assumption being made about the world independently of the evidence. Nicholas Maxwell argues that this orthodox view is untenable. He urges that in its place a new orthodoxy is needed, which sees science as making a hierarchy of metaphysical assumptions about the comprehensibility and knowability of the universe, these assumptions asserting less and less as one ascends the hierarchy. 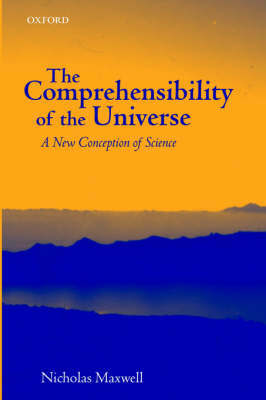 This view has significant implications: that it is part of scientific knowledge that the universe is physically comprehensible; that metaphysics and philosophy are central to scientific knowledge; that science possesses a rational, if fallible, method of discovery; that a new understanding of scientific method and rationality is required. Maxwell argues that this new conception makes possible a natural resolution of long-standing philosophical problems about science, regarding simplicity, induction, and progress. His goal is the reform not just of the philosophy of science but of science itself, and the healing of the rift between the two.